This bread reminds me of our Family Christmas Parties and my sister Cathy. She makes the best desserts and I cherish all of the holidays spent at her house. Sift together flour, salt and baking powder. Set aside. In large mixing bowl combine sugar, milk and oil until well combined. 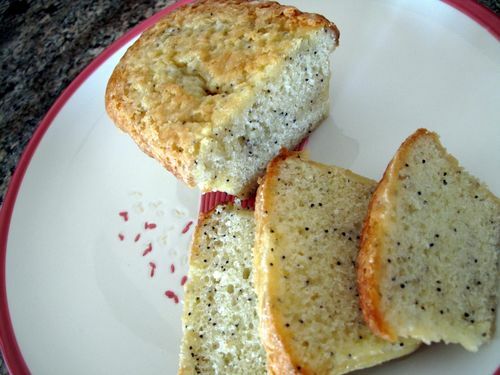 Gradually add eggs, poppy seeds, almond and vanilla. Stir until well combined. Pour in five greased and flour prepared mini bread tins. Bake 350 degrees for 50 to 60 minutes or until toothpick comes out clean. Take out of oven and immediately pour glaze over bread. Make sure to lift away sides so all of the bread is coated. Cool and wrap. Combine in sauce pan and heat until mixture is well combined. Stirring constantly. Pour over hot bread.